Having pool party games available makes the swimming party go so much smoother. We all know that a swimming pool is fun all by itself. Swimming is not supposed to be just exercise, it's a lot of fun. Add some games and you get spectacular results! One way to add more fun to the water is to play an organized game. Many games that can be played outside the swimming pool, work well in the pool also. 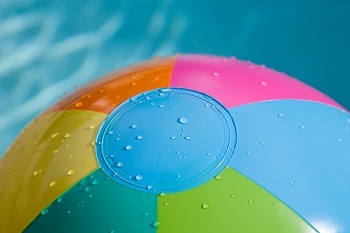 Simple games like tag, called Marco Polo while in the water, can work at the pool, lake or beach. Games played in a swimming pool are mostly simple and don't take much to set up or organize. The best way to plan the games for the pool party is to just have a list of games handy and let the guests choose which one they want to play next. The number one object of playing any game is for everyone to have fun. The moderator or host of the party is the all-powerful dictator. They may at any time change the rules or boundaries or handicap any players to help balance out the wide spectrum of abilities. Tips: Nothing worse than a freezing pool. Of course it should be refreshing, but planning a pool party and then not having the guests stay in the pool very long wouldn't be fun. Along with the organized games, it is always fun to other pool toys available for free play. Footballs, floating mats and chairs, and pool noodles are excellent choices. If you are having the food outside, it is best not to serve it in any glass container, especially the drinks. Keep in mind that safety is always your number one concern. Remember to supervise children around the pool no matter what swimming abilities they have.